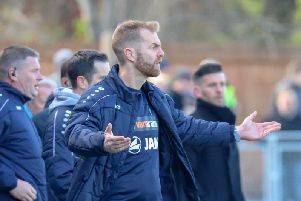 Distraught Harrogate Town boss Simon Weaver urged his fallen troops to return stronger next season after the club's promotion ambitions went up in smoke on Sunday. Town missed out on an historic place in Saturday's National League North shootout after failing to overturn a 1-0 deficit against AFC Fylde in Sunday's reverse leg. Dom Knowles cancelled out an early Fylde goal but Weaver's men were unable to find a second to force extra-time as the scores remained level on the west coast. Weaver said: “I'm really disappointed. “I wanted that next step, that next challenge. “It will take a few days but we have to breathe it in and go again. “We have to do things better again next season. Learn from where it went wrong. It's not a case of ripping it up and starting all over again. We have proven we can win a lot of games. “We have a really positive set up on and off the pitch now. “We have come a long way in a year but we won't sit back and lap it up on the beach thinking we have arrived. The Wetherby Roaders secured a club record high fourth place finish in the first year of the rebranded National League North, winning exactly half of their matches. However, Weaver's men were given an uphill task in the play-offs following the 1-0 defeat to AFC Fylde at the CNG Stadium on Wednesday. That task was made even tougher when Sam Finley rifled home from 25 yards 11 minutes into Sunday's second leg. And despite Knowles' leveller on the day four minutes later, Town failed to convert a number of chances to get back on level terms. “The lads are devastated,” said Weaver. “We have come a long way this season. It's been a long journey and in finishing fourth, we have done well in that regard. “It was like a cup final atmosphere in both games. We have just come up short in front of goal more than anything. “We were well short the other night against a very good team. We were more compact. We counter-attacked and responded to them scoring a world class goal. “The lads didn't lose believe despite the gap at the time. We probably respected them too much the other night. "The gloves were off and a lot of players came to the fore and did themselves a load of good in terms of next season. “They made the supporters proud and us proud as a management team. Weaver made five changes to the side that lost at home including the reintroduction of experienced full-back Andy McWilliams, who had not played for the club since December 19. The boss explained his decision was to keep their opponents guessing.